Domaine Le Clos des Cazaux is located in Vacqueyras, a little village of the southern Rhône Valley South of Vaison-la-Romaine, approximately 30kms of Avignon, 15kms of Orange and 15kms of Carpentras. 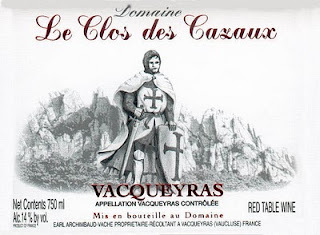 Domaine Le Clos des Cazaux belongs to the “Archimbaud-Vache” families, two family that have been implanted in Vacqueyras for centuries. In fact the Vache family has roots in the village since 1791 and the oldest verified ancestor of the Archimbaud family was apparently born in 1635. More over, the “Mas” (traditional name for a farm house or countryside house in the southern Rhône and more especially in Provence) and the tasting cellar are both from this period too. It seems that originally, the domaine belonged the Templar knights (Chevaliers de l’ordre des Templiers, thus the name of the Cuvée) who were implanted in this region. A farmer was in charge of the cattle and the various cultures. The name of such a farmer was a “Chazal”, which with time was transformed into “Cazaux” (also possibly the plural form of Chazal), actual name of the Domaine. The first plantations of vines appeared in the middle of the 19th century, but the culture of olive trees remain the principal activity until the terrible frost of 1957, which killed most of the trees. In 1936, Gabriel Archimbaud participated in the creation of the Côte du Rhône Appellation and increased the Domaine by slowly restructuring the soil and the topography of the land around the domaine to its actual size of 20 hectares. After the frost, after uprooting all the dead trees, vine growing became the main activity. After about 50 years of restructuring the vineyards and planting and replanting, the 20 hectares are now fully planted on the slopes surrounding the Domaine. The Archimbaud family started to bottle their wine under the label “Clos des Cazaux in 1959 and the rest is history. The Domaine is now run by the fourth generation of Archimbaud, the two sons of Lucette Archimbaud and Maurice Vache, Jean-Michel since 1990, who was joined by his bother, also the oenologue of the Domaine, Frederique in 1998. They also possess about 40 hectares in Gigondas. The Domaine now produces a wide range of wide: 5 Vacqueyras (2 whites, 1 rosé and 3 reds including “Cuvée des Templiers”), 2 Gigondas, 1 Côtes du Rhône and a unique and ultra limited Grenache Blanc sweet. “Cuvée des Templiers” is blend of Syrah and Grenache of 30-40 years of age in average with natural low yield. The Syrah are planted in the calcareous-sandy “coteaux” (slopes) of Vacqueyras close to the Domaine. The vines benefit of an ideal east-west exposure, allowing the sun to warm up the grapes early in the morning, an important factor for sugar synthesis and better preservation of the natural acidity. The Grenache grows in soils containing more clay than sand, which round up even more the texture of the wine. More over, the sandy soils are really poor generating even lower natural yield thus better concentration. Only 8 to 10 days are sufficient to extract all the best components during the maceration due the ideal ripeness, elements balance and acidity of the grape at harvest time. It is very important not to extract for too long to avoid over-extraction and to maintain the varietal typicity. Consequently, they obtain a very fruity wine with powerful, persistent refined aromas of cassis and red fruits with spicy and floral notes like violet due to the Syrah grape that is more predominant in the blend. Harvest and work in the vineyards are mainly done by hand, with minimal (or not at all in some cases) use of chemicals in order to respect the ecosystem of the vines and the environment. They also emphasize green harvest, cutting away about 20% of their crop, to only keep and select the best grapes to be left on the vines, therefore naturally reducing the yield to about 30hl/ha. I couldn’t get info on the ageing process…. Beautiful red-garnet color, with fresh aromas of cassis, violet and red fruits with earthy notes. The palate is rather bright and earthy, with great acidity and crisp yet ripe red fruit. The finish has excellent tannins that may need a bit of time to settle down and integrate completely. Overall, a very interesting, juicy and vibrant Vacqueyras enhanced by an inviting structure and focus attitude from begin to end, with a lingering, earthy and slightly tannic finish. Definitely a food wine to pair with grilled beefsteak and Béarnaise sauce or a thyme roasted boneless leg of lamb with gratin Dauphinois; or if you prefer to wait a few years, keep it for at least 3-5 years and pair it then with seasonal game, like pheasant, or poultry.